The QL-300 is the world’s first 5-colour toner-based tabletop label printer from QuickLabel that enables brand owners to achieve vibrant, unique and impactful branding that drives product sales. Developed with proven, reliable digital LED EP (electrophotographic) printing technology, the QL-300 is the first 5-colour desktop label printer to deliver exceptionally durable and vibrant colour labels, with the added capability of printing white. 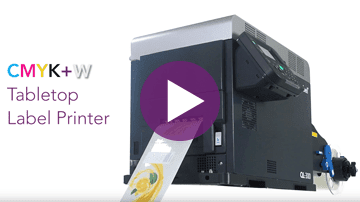 This capability opens up a realm of possibilities for product branding, allowing the user to print on a wide variety of cost-effective transparent, coloured and metallic paper and synthetic label materials in a single pass. Taking your product branding to a level beyond your competition the QL-300 delivers premium 1200 x 1200 dpi 5-color labels with unmatched durability, water-fastness and UV-resistance. With label widths ranging from 1.0” to 5.0” and roll-to-cut or roll-to-roll operation, the QL-300 also allows for flexible, short to long run print jobs while eliminating all label waste from the printing process. Going beyond the standard 4-colour CYMK printing process, the addition of printing white provides an opaque background for transparent materials, expanding the possibilities for personal care product, food & beverage product labeling and more. Printing white also presents new creative options when used on black or other coloured materials, including metallic silver and gold. The QL-300 even allows users to achieve a “spot UV” sheen or varnished appearance when printing black and other colours onto a colored matte substrate. QuickLabel’s long product life, premium printing supplies and unmatched service and support guarantees your QL-300 will continue to deliver exceptionally durable and vibrant labels, while also ensuring your brand commands the attention it deserves. Every QL-300 also includes one free license to CQL Pro, our advanced labeling software, which allows users to effortlessly design, manage and print their own labels. Ideal for: personal care products, cosmetics, food and beverage, e-liquid, chemical, promotional products labeling and more. Warranty: Each QL-300 comes with a standard One-Year Warranty, excluding wear parts. Telephone and email Technical Support Assistance. Customer Support Package: Customer Support Package to extend QL-300 One-Year Warranty. Includes up to one on-site visit (as required), QuickSwap™ Parts Repair & Replacement Service, unlimited telephone and email Technical Support assistance. An extended Customer Support Package for 2 or 3-years is also available for an additional fee. On-site Startup Package: To help you get up and running quickly, a QuickLabel specialist will come directly to your location to setup and install your QL-300, as well as provide training for operation and maintenance. This package also includes one local PC on-site driver and CQL Pro software installation, unlimited telephone and email Technical Support for setup or installation assistance up to 30 days after purchase. Quick Setup Package: This package includes a remote live printer setup session (up to 3 hours), one local PC remote driver and CQL Pro software installation and remote operational and maintenance training. This package also includes unlimited telephone and email Technical Support for setup or installation assistance up to 30 day after purchase.